Hyperfocus is an intense form of mental concentration or visualization that focuses consciousness on a subject, topic, or task. In some individuals, some subjects or topics may also tend toward including daydreams, concepts, fiction, the imagination, and other objects of the mind. Or, hyperfocus can also cause or be distractions, or cause side-tracking away from assigned or important tasks. Or to put it simply, flow comes naturally while hyperfocus is forced, resulting in the exact opposite effect it was intended to have. Road games lately, have been tough for Michigan. Big road games especially, don't go well. For a team that is 19-0 at home over the last 3 seasons and 5-7 on the road, there's something going on there. Michigan Stadium is louder than it used to be, which is great and all, but it's not the home-field advantage that gives opponents nightmares. It is a lack of confidence on the road...over-confidence? It is coaching? Preparation? Flow versus hyperfocus? Or is it just the simple fact that Michigan gets everyone's best shot all the time...and gets exposed more on the road? Either way, in high-profile road games, in tough environments, Michigan doesn't win. It's hard to be optimistic about Michigan's changes against Michigan State this weekend. A Spartan team that prides itself on beating Michigan above all else is a 4.5 point favorite. And as I sit here on Monday, looking at all of Michigan State's faults...including that they've yet to play a ranked opponent (so has Michigan)...I can't argue with that line. Oddly, Michigan and Michigan State are the only two teams in the B1G not to play an opponent not currently ranked. With both teams ranked right now, that will sort of take care of itself this Saturday, briefly, as the loser will fall out of the polls. Correction: Notre Dame was ranked #13 when they played Michigan, and #21 when they played Michigan State. ND was unranked following their loss to Oklahoma on 9/28 and just reentered the coaches poll at #25 this week following their win against Navy. They are not ranked in AP poll. In 2011, Michigan was dominated, bullied, by Michigan State defensively. On a windy day in Spartan Stadium, a 6-0, #11 Michigan team struggled to even get to 250 yards of offense. Denard was 9-24 for 123 yards, 1 TD and 1 pick. Michigan ran the ball 36 times for 82 yards. It was a miserable day offensively for the Wolverines. The 2012 matchup, although a win for Michigan, wasn't much better. 163 yards both passing and rushing was an improvement, but drives stalled frequently. Michigan was 5 of 15 on 3rd down. 2 redzone trips resulted in 2 field goals. And when it was all said and done, Michigan's 4th field goal of the day proved to be the game winner, 12-10. Michigan State was able to neutralize Denard Robinson maybe better than anyone else during #16's career at Michigan. Sparty played very stout, disciplined defense against him, and it paid off 2 out of 3 times. While Gardner is a more balanced passer which makes Michigan offense much more formidable in that regard, Michigan State with their #1 overall defense in the country, will try to do just as much to disrupt the Michigan attack this year as well. With two weeks to prepare and an defense that, statistically, matches up well against Michigan State's mediocre offensive attack, those are two big advantages that Michigan has going into this game. Michigan's offense against Michigan State's defense truly is strength-on-strength, an will be very interesting to watch. I expect a low-scoring game where a turnover or special teams play could be the difference. For Michigan, this is a very pivotal game for the division race. Basically, if they lose, this season is over. The chances of getting to Indianapolis with 2 B1G losses (including the tie-breaker to a 8-1 Michigan State team with a soft schedule) is almost impossible. A win however, will have the opposite effect. 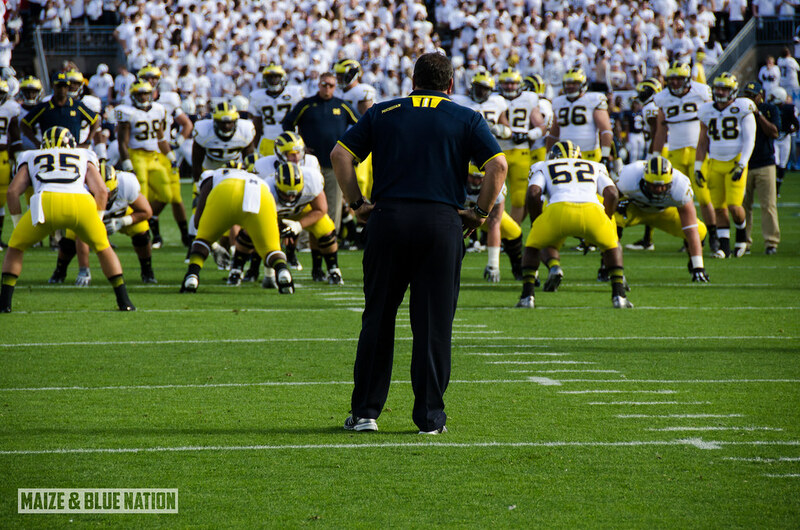 For Brady Hoke, at this point in his career at Michigan, the stakes couldn't be any higher. He must win a major, nationally-televised road game. This can't be overstated enough. The outcome of this game will go a long way in either quieting the pundits, or fanning the flames. A loss this Saturday, especially after the Penn State debacle, will really turn up the heat under Hoke. Wrong, Notre Dame is currently ranked 25th in the BCS and Coaches Poll. ND's only losses on the year are to Michigan and #10 Oklahoma. Michigan beat ND 41-30 and ND beat MSU 17-13. ND isn't a great team, but they're still ranked.